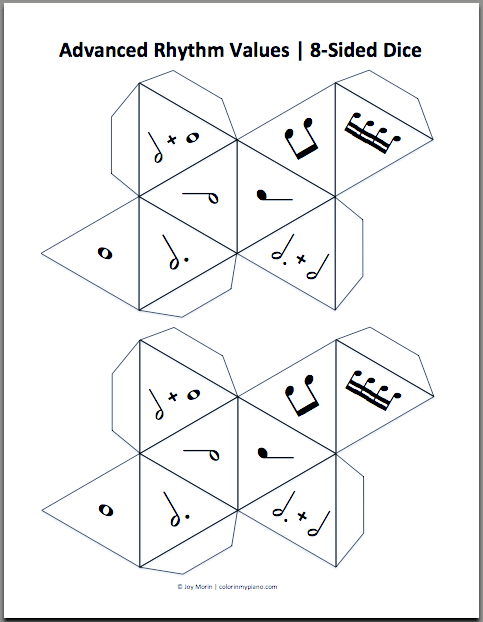 Just added to the Printables > Other Resources page: Musical Dice! Basic Accidentals (6-sided dice) | This die allows for three possible rolls: sharp, flat, and natural. Basic Intervals Unison-3rd (6-sided dice) | This die allows for three possible rolls: unison, second, and third. Intervals Unison-8va (8-sided dice) | This die allows for eight possible rolls: unison, 2nd, 3rd, 4th, 5th, 6th, 7th, and 8va. Basic Rhythmic Values (8-sided dice) | This die allows for four possible rolls: quarter note, half note, dotted-half note, and whole note. Advanced Rhythmic Values (8-sided dice) | This die has eight different sides: four sixteenth notes, two eighth notes, a quarter note, a half note, a dotted-half note, a whole note, a dotted half note + a half note, and a half note + a whole note. Because the possible rhythmic values on this die are worth between 1 and 6 beats, this die can be used to replace a standard 6-sided die. Triad Qualities (8-sided dice) | This die has four possible rolls: major, minor, augmented, and diminished qualities for triads. Musical Alphabet (8-sided dice) | This die has eight possible rolls: A, B, C, D, E, F, G, and WILD. Advanced Intervals PU-P8 (12-sided dice) | This die has twelve possible rolls: PU, m2, M2, m3, M3, P4, P5, m6, M6, m7, M7, and P8. Solefege (8-sided dice) | This die has eight possible rolls: do, re, mi, fa, sol, la, ti, and WILD. Keys (12-sided dice) | This die has twelve possible rolls: C, Db/C#, D, Eb, E, F, F#/Gb, G, Ab, A, Bb, B/Cb. Instructions: Print these dice pdfs onto cardstock paper (color optional – might be nice to help tell apart the different dice), cut out, fold the edges, and assemble using tape. Putting together these dice may take a little time and patience. Don’t try to tackle those 12-sided dice until after you’ve had some practice with the eight-sided ones! In a game that involves a standard die, try replacing it with the Advanced Rhythmic Values die (page 5) to add an extra twist to the game! Students must determine the number of beats the rhythmic value is worth in order to determine what number they have rolled. Test your beginner/elementary students’ ability to find the keys on the piano during a private lesson by combining the Basic Accidentals die (p. 1) with the Musical Alphabet die (p. 7). The student rolls the two dice and must find the correct key on the piano. Review scales, arpeggios, and cadences with advanced students by rolling the 12-sided Keys die (page 9). There are many, many fun ways these dice can be used during group games or private lessons with students. I hope to eventually share some more examples of games that utilize them — but in the meantime, if you come up with games to play using these dice please share them in the comments! I’m excited to hear what you come up with. And if you have requests/ideas for more musical dice, please let me know! I can’t wait to try these once my ink refill comes! Thanks for posting. Thanks Heidi! Let us know how they work out! Wonderful idea ! Congrats for your website. I was wondering if it’s possible to make the “key-dice” in french, with “do, ré, mi…” for my students in Paris. Do you have a “blank” version of the pattern that i could fill in with french keys ? Thank you ! Great stuff. Would love to have one with dynamics (pp,p,mp,mf, ff). Would also use the solfege one. Very cool BUT where is this PDF file??? Just want to thank you for the dice. I use so much of your stuff, I have used the rhythm dice, but not the other dice yet until this past group lessons with my advanced students. I used the 8 sided interval dice and the 12 sided keys dice along with The Fishy Intervals laminated sheets from “Piano Discoveries” The students rolled both dice then raced to see who could write all the intervals on the correct Fishy Interval page (MmdA on the one for 2, 3,6,7 or PdA on the one for Prime, 4, 5) with their dry erase markers. First they had to go up from the starting key shown on the dice, then after a couple of rounds they had to go down which was much more difficult. They loved it and didn’t want to quit! So simple, entertaining, yet really making them think and learn their intervals. I was wondering where the pdf is? I can’t find it! Would love to have it though! Can you make one for dynamics? pp, p, f, ff, cresc, decres?